For the whole month of July, we are going to DECLUTTER our WHOLE house in just a few minutes each day. I don’t know about you, but I have been feeling a little overwhelmed at the amount of stuff in all areas of my home. We used to have a rule that one thing had to leave when another came in, but that has been long since abandoned. Well meaning friends and neighbors have blessed our large family with clothes and accessories, and while I am extremely grateful, I am feeling the walls close in on me a bit. So, I have decided to run a 31 Day Declutter Challenge in the month of July and I would love for you to join me. We will be going through each room of our homes and through all those typical spots where clutter naturally appears, in an effort to breathe a little easier. This will be a quick runthrough, designed to get you purging and eliminating all that unused or unloved ‘stuff” in your home. The idea is to keep this SIMPLE and easy to keep up with, not add to your overwhelm. I will not be giving you any projects or huge organizing plans. I have set up a plan and will give you a task each day to follow, along with some added helps for you. I have created some fun printables for you to use if you wish. As a reminder, this is a quick decluttering. You will not be thoroughly cleaning every area of your home in 10 minutes a day. This is designed to give you a jump on what I hope will inspire you to keep going with me for the rest of the year. I have some fun things planned for the next few months. Use a timer to stay focused. Again, we will be spending 10-15 minutes a day decluttering. I do not want you to get overwhelmed while doing this and burn out. Stay with me. Don’t overthink things as you go through them. If you think too long about whether to get rid of something, you will find it a lot harder to part with. Keep what you love and use, and get rid of the rest. Keep a donation basket handy. As soon as it is filled, take it to your car and don’t hesitate. It will bless someone else and you will feel better for it. Over the next few days, I will give you a couple fun printables you can use for the challenge if you wish. I think you will be amazed at what you can accomplish in just a few minutes a day. I know I am eager to get going and see my bathroom counters again! Feel free to ask me any questions as we go along. I will post each day on the blog as well as on Facebook and Instagram. If you are following along with me, use the hashtag #SimpleHomeChallenge so we can all see what we are accomplishing and get some new inspiration. 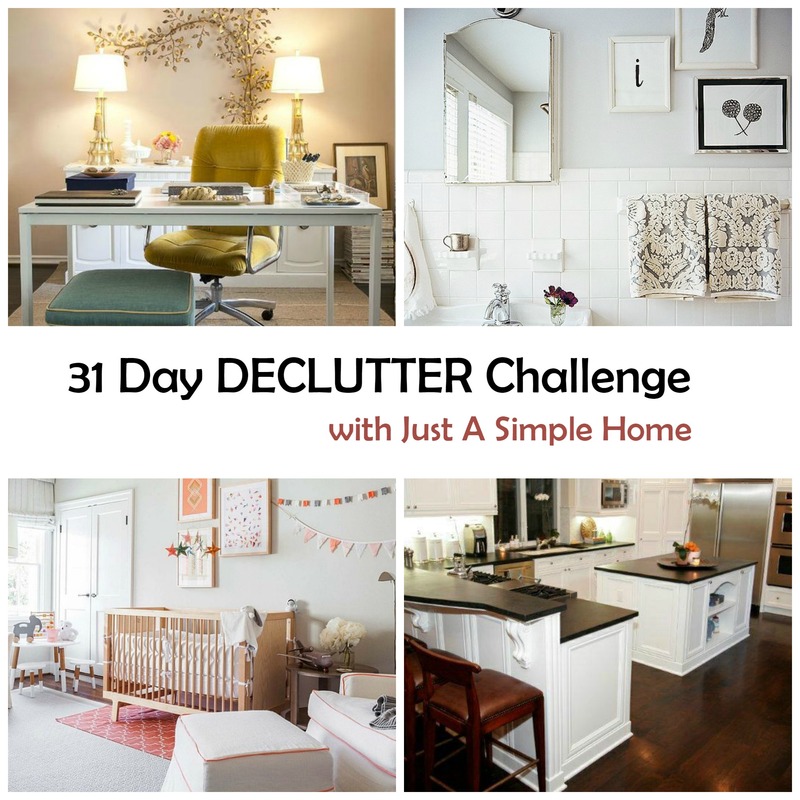 I am excited to have you join me in this 31 Day Declutter Challenge! Ooo this sounds like something I need to do! I’m horrible at keeping things and then forgetting to throw them out! Hi Adriana, I hope you will join in! Leave your email and you’ll get notified when we start. This is something I try to do…declutter a little bit each day. I have a trash bag in the guest bedroom to put our too small clothes in as we come across them so I can take to the Goodwill when it fills up. Mary, that is a great idea. Thanks for sharing! I NEED TO JOIN IN ON THIS! My closet especially! Oh yes I need this! I have so much clutter!! Bookmarking this! We are headed out on vacation but when we are back I am going to need to purge. We have so much stuff that we don’t need/use/love that it’s time to move stuff on to people who can use them! Hope you have a great time! You’ll be able to follow the posts when you come back, they’ll be numbered. oh good luck!! Having just moved I am so happy to be living a decluttered life! And plan to keep it up!! A little everyday helps so much! I agree Angela! It is nice when you have a new home and not much stuff. Then it starts to take over, lol. Wow, is that really your home? Looks like something out of a magazine! I really need to learn how to declutter for sure! I hope you can join in Amy! I just joined in! I seriously need to do some decluttering before my baby arrives in August. This is the perfect way to get started! I can’t wait to get your tips and ideas. Thank you Jenna and congratulations! I bet you are well versed 🙂 Thanks for sharing! My father always had a saying “Everything has a place” so I grew up in a home without clutter and I can’t stand clutter in my house. I’m constantly purging and thankfully both my hubby and daughter are the same way. Her friends moms always love when she comes over because she straightens up everyone’s playrooms while she’s there! LOL, we created a monster! I will be honest I am not good with challenges at all but I feel like I need to participate. I will be following along as much as I can! Awesome challenge. I have a few friends that could use it and might be willing to join. Thanks for passing it along Jill! I’m constantly trying to declutter our tiny home! I think I couldn’t possibly find anything else to donate and then I do! I’ll have to take you up on your challenge. I hear you Wendy…with 6 young kids at home, it is a constant struggle for me too. I love the idea of decluttering a few minutes every day. I always get discouraged when I have to clean or declutter for long periods of time. I will have to try this out! Glad you will be joining in Dawn! This looks like an awesome challenge! I’m constantly trying to declutter my house! Thanks Kristin, I am excited for it! What a great challenge to be a part of. I think that almost everyone can use some decluttering in their homes, including me! That first nursery photo is absolutely stunning and really gives me the push to declutter our space and only hold onto the pieces that are meaningful in our home. I so need this for sure. I want to find my floor again. I seriously need to declutter… my house is a disaster! Finding the time seems impossible though. I just joined! I don’t know what is wrong with me this year but de-cluttering stuff took so long for me. I didn’t finish doing it in the Spring so I am hoping this summer it will help me keep focus on it! I’m so happy you did Cara! I’m in! My husband and I don’t have tremendous amount of stuff, but we moved to Germany for a few years right after we got married, so we still have my pre-marriage stuff, his pre-marriage stuff, and all the duplicates of things we forgot/couldn’t bring to Germany with us. So glad you are joining us Claire! I feel like I am constantly decluttering. Stuff really adds up the more people who live in a house! I hate clutter and things accumulating so I often toss things out.